Wakey find home comfort with their first win at Belle Vue since last summer... but Trinity are to quit their traditional home at the end of the season. We speak exclusively to chairman Michael Carter about his decision to relocate. Wakefield aren't the only club on the move – not according to Nosey Parker, who's hearing Leeds could be off to Odsal! (Temporarily, at least). We have the best coverage of all the action in the Betfred Super League, including no-nonsense analysis from Danny Lockwood of wins for Wigan and Hull as Warrington and Saints continue to struggle. Find out who our Team of the Week and Player of the Week are... there's deserving recipients for both! Warrington launch an investigation into crowd trouble, the RFL rule out a Super League lifeline for an NRL bad boy, Josh Drinkwater talks about his decision to snub a return Down Under and 'Union lad' Greg Minikin vows to Cas fans he won't be following in Denny Solomona's footsteps. 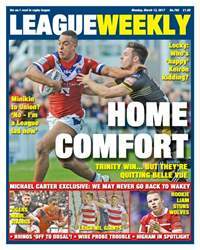 Plus, win VIP Super League Grand Final tickets with our League Weekly Tipping Challenge!